Being John Malkovich is a delightful movie that’s about as innovative to the dramedy as The Godfather was to gangster genre, or The Seven Samurai was to the epic. It is blazingly original, hugely creative, and very moving. The movie certainly isn’t in everyone’s taste but it is very rewarding if you do. Credit must be given to screenwriter Charlie Kaufman, who adds the film’s flair that director Spike Jonze translates well to the big screen. Any other writer-director duo might have not worked as well. 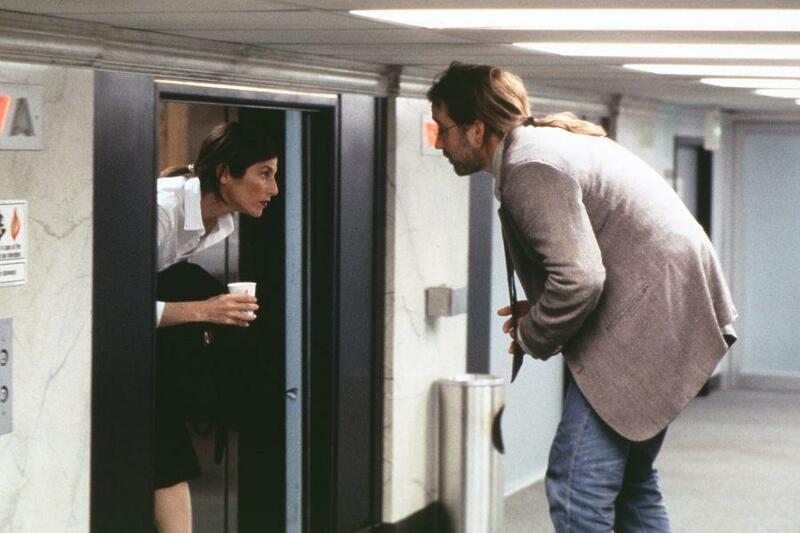 The movie is made up of so many good ideas that even a small bit of Being John Malkovich could be made into a film itself and still be spectacular. But enough with my praises and I’ll go on to the plot. The movie is about Craig Schwartz (John Cusack), a sad sack puppeteer who is married to Lotte (a hardly recognizable Cameron Diaz), a local pet store owner. Lotte keeps a bunch of animals at their house, including a chimpanzee and a parrot. Craig shows off his puppets down on the street corner but most people dislike his work. Lotte convinces Craig to get a real job, leading him to become a filer for a office located on the 7 1/2 th floor. You heard me correctly. The office ceiling is half as high as it should be and Jonze supplies us with the hilarious origin of the floor. There Craig meets Maxine (Catherine Keener), who he immediately falls in love with, even though he’s married. Craig wants her love, but Maxine could hardly care about him and continuously mocks him throughout the film. When Craig tells her that he’s a puppeteer at a bar, Maxine asks for the check. Soon Craig discovers a tiny door that opens a portal into John Malkovich’s brain. When Craig enters, he sees whatever Malkovich is doing at the current moment. After fifteen minutes he flies out at the New Jersey Turnpike and is bewildered by the experience. Craig loves puppeteering as he views it as becoming another person. With John Malkovich’s portal he can actually do this. When Craig tells Maxine, she decides to use this as a business opportunity. People come rushing in, hoping to discover what it’s be like to be in a different person’s shoes. When Lotte enters, she discovers she’s attracted to Maxine, leading between a showdown with her and Craig. If in the wrong hands, this material could have been handled very poorly. But Jonze and Kaufman know what exactly what they’re doing throughout the entire film and handle it very well. As I said before, the film is a dramedy, a drama with bits of comedy in it. We’re shown a sad lonely man who sees the portal as an opportunity to become happy. Why does Kaufman choose Malkovich in the story? Maybe because of the public image most think of the actor as a distanced person from the rest of society. Malkovich isn’t really playing himself but rather a parody, and like Larry David of Curb Your Enthusiasm does it very well. He brings much of the magic in the film and is very bold in doing so. In one scene a taxi driver informs him that he played a jewel thief in a film which he actually hasn’t done. There’s a very funny cameo with Charlie Sheen in it, who actually does play his exact self (watch the movie to see what I mean). And in another situation, Malkovich enters his own portal, leading to one of the most hilarious scenes ever to be filmed. The performances by Cusack, Diaz, and especially Keener help fulfill the cleverness of the script. Keener deservingly took a Oscar nomination for her role, and provides much of the film’s emotion impact. Cusack is brilliant in his role as Craig and really gives us an understanding in a gloomy man’s view. Diaz, who usually is dismissed by most, is great as well and if I didn’t stay into the credits I probably would have realized it was her. The movie is full of surprises and I wouldn’t want to ruin it for you. While most films tend to be predictable or paced unevenly, Being John Malkovich has your eyes glued from the first minute to the last. It’s a delightful film sure to make you laugh and cry and is a truly emotional experience.